Parkinson’s disease (PD) is a brain disorder that leads to motor symptoms, such as shaking (tremors) and difficulty with walking, movement, and coordination. Patients with PD may also experience non-motor symptoms, such as changes in mood or cognition. PD is a progressive and neurodegenerative disorder. Approximately 60,000 Americans are diagnosed with Parkinson’s disease each year, and more than one million people suffer from the disease in the United States. PD is the second most common neurodegenerative disorder after Alzheimer’s disease. A major finding in individuals with PD is the loss of dopamine-producing neurons that normally send signals that coordinate muscle movement, balance, and gait. As a result, the common motor symptoms of the disorder are tremor, or trembling in hands, arms, legs, or chin; rigidity, or stiffness; slowness of movement and impaired balance and coordination. The disease most often develops after age 50 and symptoms vary from patient to patient. The clinical diagnosis of PD sometimes can be difficult. Molecular imaging can aid in distinguishing PD from other types of neurodegenerative disease, side-effects of drugs, toxins or strokes. In turn, this can improve how physicians treat patients. For example, PD can sometimes cause psychotic symptoms and correct diagnostic imaging can curtail the use of antipsychotics which can be harmful to those with PD. PD is the most common among a group of movement disorders called Parkinsonian syndromes, all of which result from a loss of dopamine-producing neurons. Studies of brain tissues of persons with PD have shown typical microscopic findings of so-called Lewy bodies. This is called typical or idiopathic PD. With no known cure for the disease, the goal of treatment through medication is to control symptoms. Patients may be prescribed L-DOPA, a drug that can be converted in the brain to dopamine. In some cases, surgery may be appropriate for patients whose disease no longer responds well to drugs. A therapy called deep brain stimulation (DBS) has now been approved by the U.S. Food and Drug Administration. In DBS, electrodes are implanted in the brain and connected to a small electrical device. Molecular imaging is a type of medical imaging that provides unique, detailed pictures of what is happening inside the brain at the molecular and cellular level. Other diagnostic imaging procedures—such as x-rays, computed tomography (CT) and ultrasound—predominantly offer anatomical pictures. Molecular imaging excels at detecting the cellular changes that occur early in the course of disease, often well before structural changes can be seen on CT and MR images. Molecular imaging can detect abnormalities in the brain months or years before structural changes might occur. Once the imaging agent is introduced into the body, it accumulates in a target organ or attaches to specific cells. The imaging device detects the imaging agent and creates pictures that show how it is distributed in the body. This distribution pattern helps physicians discern how well organs and tissues are functioning. 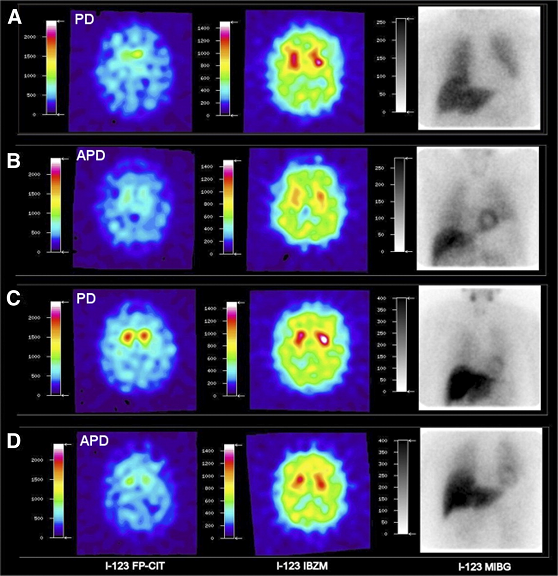 Two common clinically used molecular imaging technologies are positron emission tomography (PET) and single-photon emission computed tomography (SPECT). Single photon emission computed tomography (SPECT) involves the use of an imaging device (SPECT scanner) and a radiotracer that is iinjected into the patient's bloodstream. In perfusion SPECT imaging, the tracer accumulates in cells based on how much blood flow they are receiving. Since blood flow is a correlate of activity in the brain, SPECT show areas of increased and decreased brain activity, In dopamine SPECT, the amount of active dopamine-using brain cells is quantified and aids in diagnosis of Parkinson's disease. PET involves the use of an imaging device (PET scanner) and a radiotracer that is injected into the patient’s bloodstream. A frequently used PET radiotracer is 18F-fluorodeoxyglucose (FDG), a compound derived from a simple sugar and a small amount of radioactive fluorine. More active brain cells accumulate more FDG tracer. Once the radiotracer accumulates in the body’s tissues and organs, its natural decay eventually produces photons. The PET scanner, which is able to detect these photons, creates three-dimensional images that show how the radiotracer is distributed in the area of the body being studied. uses advances x-ray equipment and in some cases a contrast-enhancing material to produce three-dimensional images. Are PET and SPECT safe? Many medical procedures have side effects and risks; the same is true of nuclear medicine diagnostic tests such as PET and SPECT. Each procedure takes a certain amount of radiation to perform appropriately. Used in the right way for the right patient at the right time, nuclear medicine is very safe—the benefits of the procedure very far outweigh the potential risks. What molecular imaging technologies are used for Parkinson’s disease? Because multiple neurological disorders mimic Parkinson’s disease, the disease can be difficult to diagnose. Scanning with the FDA-approved radiotracer I-123-ioflupane injection (also called DaTscan) and a SPECT scanner may allow for earlier and more accurate diagnosis of Parkinson’s disease (Djang et. al 2012). A scan using DaTscan is able to detect dopamine transporters (DaTs). The distribution of DaTs is abnormal in patients with Parkinsonian syndromes but normal in patients with other conditions, such as essential tremor. What are the advantages of SPECT and PET for the brain? Is molecular neuroimaging covered by insurance? Check with your insurance company for specific information on your plan. Not all procedures descripted herein are covered by every insurance plan.